The Chevrolet Avalanche is a versatile truck featuring a spacious crew cab cabin and a flexible middle gate than can be opened to increase loading space. All-wheel-drive is an option. The Chevrolet Avalanche was completely redesigned for 2007, receiving a contemporary exterior and higher quality interior. For 2008, there are no notable changes. 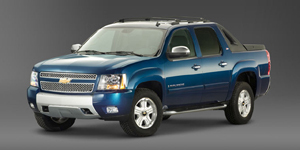 Find the used Chevrolet Avalanche of your choice from a dealer in your area. Search our used car listings now.